In partnership with Cuisine et Vins de France. Through an exceptional itinerary, PONANT invites you to discover an unspoiled America where the past seems to have left a still intact, indelible mark. From Fuerte Amador, you will set sail aboard the L’Austral for a 10-day cruise from the wild islands in the Gulf of Panama to the legendary land of the Incas. On the way to Ecuador, the L’Austral will stop in the Pearl Islands, which nestle in the Gulf of Panama. In the heart of this paradise, you will discover Mogo Mogo, a secret island with exceptional marine life. L’Austral will then sail on to the magnificent Darien National Park in Panama. This little corner of paradise is a UNESCO World Heritage site and home to remarkable plants and wildlife. Sandy beaches, rocky coastlines, mangroves, swamps and tropical rainforests vie with each other for beauty and offer a feast for photographers. This will also be the occasion for meeting the astonishing semi-nomadic Emberas community. You will then visit Santiago de Guayaquil, (‘the pearl of the Pacific’. This surprising city in Ecuador will enable you to reach Quito, a capital listed as a UNESCO World Heritage Site, or Cuenca, a small city that time forgot, with colonial houses decorated with stucco. When the ship arrives at Callao, you will be able to visit Peru’s main fishing and commercial seaport. From museums to old churches and stately mansions, the city also boasts a unique and rich architecture. Guayaquil, (gwä-yä-kêl´) city (1990 pop. 1,531,229), capital of Guayas prov., W Ecuador, on the Guayas R. near its mouth on the Gulf of Guayaquil, an inlet of the Pacific Ocean. It is Ecuador’s largest city and its chief port and manufacturing center. Founded by Sebastián de Benalcázar in 1535, it was liberated from Spain by Antonio José de Sucre in 1821, and in 1822 was the site of a meeting between Simón Bolívar and José de San Martín that determined the course of South American independence. The climate is hot and humid. 1. The rates of our cruises are per person and include the following: All meals while on board the ship (from dinner on the day of embarkation to breakfast on the day of disembarkation) Captain’s welcome cocktail and gala dinner Mineral water, tea, filter coffee, a selection of white, red and rosé wines offered during meals; afternoon tea Evening entertainment and events Luggage transfer from pier to the ship and vice versa Room service 24h (special selection) English speaking lecturer on selected sailings. Water sports activities (except scuba diving) using the ship’s equipment, when permitted by local authorities and confirmed by ship Master according to safety and sea conditions onsite Open Bar (pouring wines, house champagne, alcohol except premium brands…list available upon request). 2. 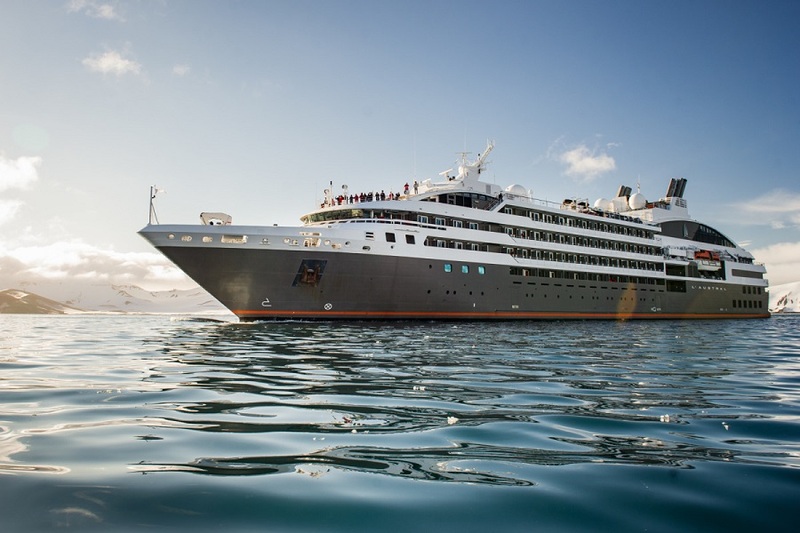 Cruise rates don’t include: Airport taxes (subject to modification) Port and safety taxes, environmental charges, landing and access fees to National Parks, special and/or Protected zones or sites subject to specific permits from National authorities and/or local communities (included only in cruise package sold in US/Canada). Any ground services before and/or after the cruise other than the ones mentioned in each “Cruise & Flights” package and for which details are available upon request. Optional Spa package to be booked prior your departure; please ask for more information Optional shore excursions. Beverages other than the ones mentioned. Laundry services, hair salon and à la carte Spa treatments Personal expenses, on board medical consultations and drug prescriptions. Gratuities (included only in cruise package sold in US/Canada). Cancellation/luggage/assistance/repatriation/medical insurance(s) Visa fees, if applicable It is essential not to forget to bring with you your binoculars for a good fauna observation. Please do not forget to bring your medical certificates when it is required to participate in an expedition cruise.